Some promising ideas were pitched to the judges, ideas that could serve as the basis for representing Pakistan at international-level ITU events, including ITU TELECOM World 2017 and also to participate in the Young ICT Leaders’ Forum at ITU TELECOM World. 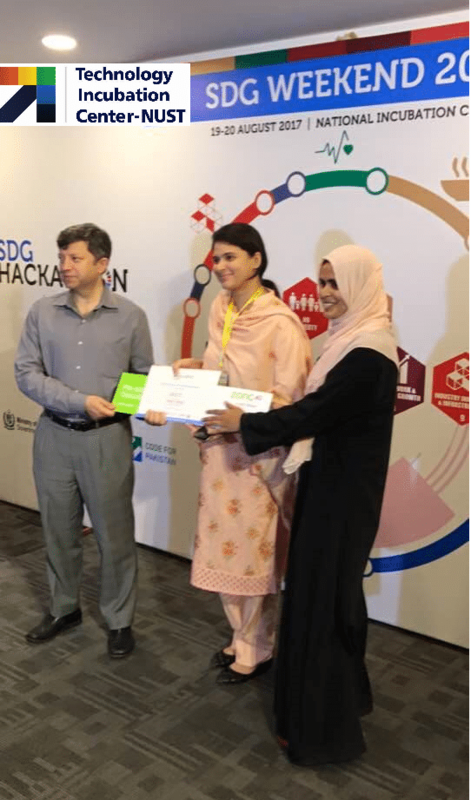 SDG Hackathon 2017 crowned Orbit as the winner of the SDG Challenge Cup. Orbit, which is incubated at Technology Incubation Centre NUST, was also awarded a cash prize of Rs.150,000 and a chance to go global and pitch their idea at the ITU Telecom World in Korea, an international platform for influential figures and IT innovations that change the world for the better. Orbit achieved this distinction from amongst 17 other startups that were also selected for the pitching session at the National Incubation Center. The hackathon, organized by Ignite and Code for Pakistan, was a two-day event. Orbit wants to revolutionize the learning process with the use of augmented reality (AR). It hopes to make it easy to grasp concepts that are portrayed in 2-D by translating them to 3-D, and enabling anyone to interact with the images via an interface. This aids in giving the student a literal depiction of something that is otherwise hard to understand. TIC NUST is currently incubating more than 30 startups with credible teams and proven business models.